Villamartin There are numerous restaurants from Mexican to Italian. 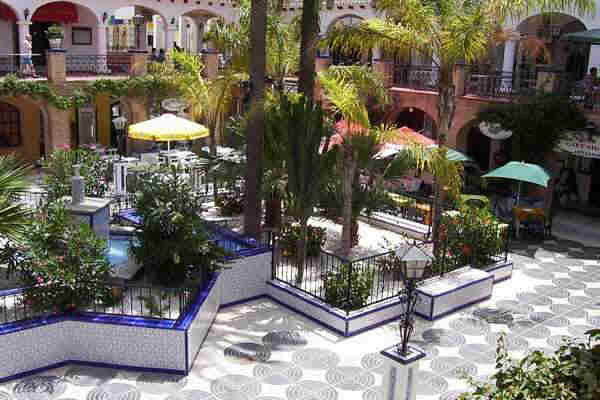 At night the plaza is lit up with holiday makers dining in the palm covered court with parrots nesting above. There are various bars on the three levels from the Irish bar to “Tommys” the local pub home from home. Plus of course local Spanish Restaurants. Villa in Spain at Las Colinas Golf & Country Club Fontanella, 4 – Urbanización Roble 9, Villamartin Featuring an outdoor pool and whirl-plunge pool, Villa in Spain at Las Colinas Golf & Country Club offers a sun terrace, garden and furnished terrace with barbecue facilities. More It has uninterrupted views over the golf course and hills. This spacious villa includes central heating, air conditioning and free WiFi throughout. There is a living room with a fireplace, a flat-screen TV with satellite channels, an iPod dock and a DVD player.The modern kitchen is equipped with an oven, microwave and dishwasher. A washing machine is also available. Each room includes a wardrobe, fan and safety deposit box. There are 3 double bedrooms and 3 bathrooms with a shower or a bath. Bed linen and towels are provided. Holiday home Golf Campoamor&Villamartín Paraguay 7 35, Villamartin There is 1 person looking at this holiday home. Offering an outdoor pool, Holiday home Golf Campoamor&Villamartín is located in Villamartin. The accommodation will provide you with a TV and a terrace. There is a full kitchen with a dishwasher and a microwave. Featuring a shower, private bathrooms also come with a bath.—–You can enjoy pool view from all the rooms.—At Holiday home Golf Campoamor&Villamartín you will find barbecue facilities and a terrace. An array of activities can be enjoyed on site or in the surroundings, including golfing. This holiday home is 43 km from Alicante Airport. Holiday home Golf Campoamor&Villamartín Paraguay 7 35, Villamartin There is 1 person looking at this holiday home. 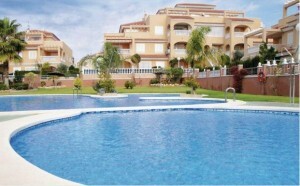 Offering an outdoor pool, Holiday home Golf Campoamor&Villamartín is located in Villamartin. Free WiFi access is available in this holiday home. The accommodation will provide you with a TV and a terrace. There is a full kitchen with a dishwasher and a microwave. Featuring a shower, private bathrooms also come with a bath. You can enjoy pool view from all the rooms. At Holiday home Golf Campoamor&Villamartín you will find barbecue facilities and a terrace. An array of activities can be enjoyed on site or in the surroundings, including golfing. The property offers free parking. Holiday home Abeto 6, Block1 Nr 5, Fase is a holiday home with a patio, situated in Villamartin. 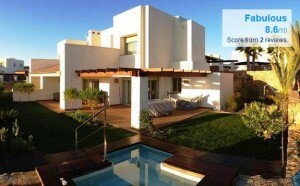 The property is 50 km from Alicante and features views of the sea. Villamartin is an established resort with everything you need for a great holiday. There are shops at the plaza that have the usual everyday needs for a self catering holiday. There are numerous restaurants from Mexican to Italian. At night the plaza is lit up with holiday makers dining in the palm covered court with parrots nesting above. There are various bars on the three levels from the Irish bar to “Tommys” the local pub home from home. The entertainment ranges from disco to karaoke or the singer belting out the old favourites. Music for every age young or old. All in a self contained plaza where the children can play safely. There is also a cinema and bowling alley. For the golfer there is a challenging 18 hole championship golf course 10 minutes walk from the Plaza. The Open was played here some years ago. The golfers can be seen around the resort driving back to their apartments in golf buggies. A further three golf courses are all a short drive from Villamartin. A golfers paradise! If you want a change from the plaza, there is another development 15 mins walk from Villamartin called Los Dolsis. It has the usual restaurants and bars. There is also a very good Thai/Japanese restaurant which would rival anything in Europe. For the budget minded there is also a chinese restaurant that has a buffet menu for €4.50 per person. It is very popular and you need to get there early. There are several beaches 5 mins drive from Villamartin, so a hire car would be useful. The beaches are all blue flag and go for miles. The main town heading towards Alicante is called Torrevieja which is 15 minutes drive from Villamartin. There are all the quality shops you would expect of a larger town. It is also home to the hypermarket for all the smokers and drinkers. Heading towards Cartagenta is the Resort of La Manga, about 40 to 50 minutes drive where the England football team trained. It is the Las Vegas of the Costa Blanca and growing in popularity. A short drive from Villamartin is the charming village of San Miguel which is well worth a visit. There is a cave restaurant which is built into the hill and you have to book early. There is also a bar called the “peanut bar”. It is a local’s house who wanted to turn it into a bar several years ago. The Mayor refuse to give him permission (he had upset him somehow). So your drinks are free but you pay for the peanuts he serves with your drink! Local Golf area spain info Costa Blanca Villamartin Rentals Rentals for large villas, spain info. Costa Blanca Villamartin Rentals Rentals for large parties, spain info Costa Blanca Rentals Rentals for large wedding parties, spain info. Costa Blanca Villamartin Rentals Rentals reunions, spain info Costa Blanca Rentals Rentals for any special gatherings, spain info Costa Blanca Rentals Rentals for school reunions, spain info holidays. Costa Blanca Villamartin Rentals Rentals, spain info holiday villa Costa Blanca Rentals Rentals, spain info holiday apartment. Costa Blanca Rentals Rentalsa, spain info holiday bed an breakfast at Costa Blanca Villamartin Rentals Rentals, spain info holiday gueste house at Costa Blanca Villamartin. Spain Info, villamartin. San Francisco De Asis, Urb La Marina, San Fulgencio, 03177, Alicante, Spain.